As of spring 2013, this ranch is closed. We are not sure when or if it will reopen. 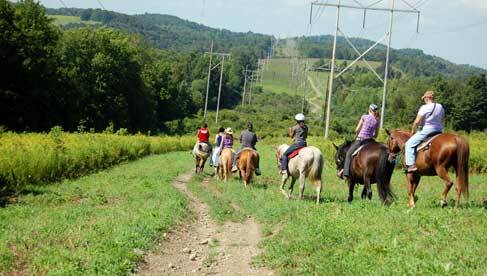 Please check out other options for horseback riding in the Northeast and beyond. 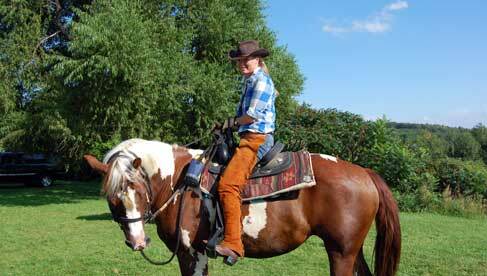 Saddle up the horses and experience a taste of the the "Real West" in the East, at The Hill Top Ranch, one of the premier New York Guest Ranches. 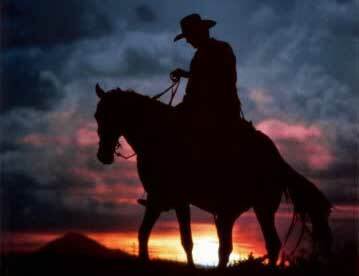 Hill Top's friendly cowboys will accompany you on horseback rides you won't forget as you learn from experienced Wranglers about ranching, cattle, horses, and cowboy living. 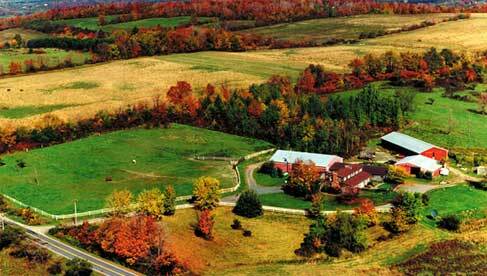 Your cowboy adventure begins at the foot hills of the Adirondack wilderness amidst hundreds of acres of colorful rolling hills. With deer, fox, coyotes, wild turkeys, eagles, hawks and occasional moose all living in the area surrounding the ranch, you have awe inspiring views. 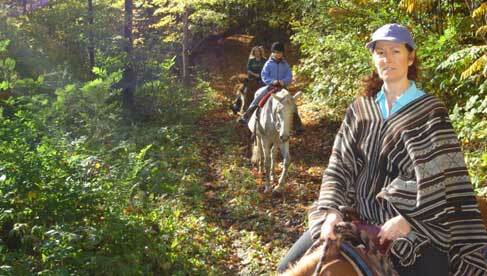 Hilltop Ranch invites you to explore the east coast's largest forest preserve on their overnight pack trips. 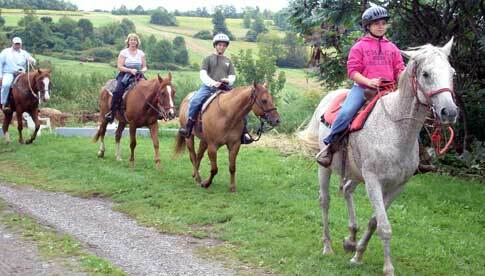 These horse pack trips allow guests to enjoy riding into the great Adirondack Wilderness, the nations largest wilderness area with over six million acres of forest, mountains and lakes and larger than Yellowstone, Yosemite, and Glacier National Parks combined. 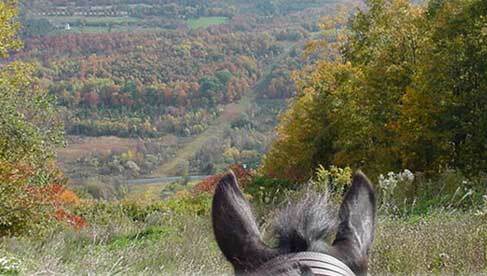 While mounted on great horses that are the heartbeat of Hill Top Ranch, you can ride all day and for many days and never see the same trail twice. 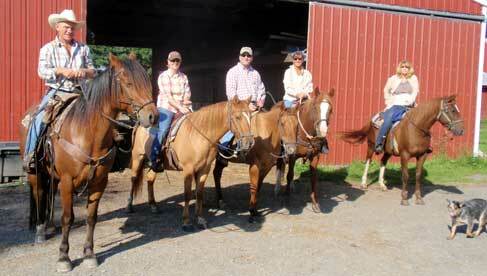 A quick flight from most of the major cities in the northeast Hilltop Ranch is easy to get to. 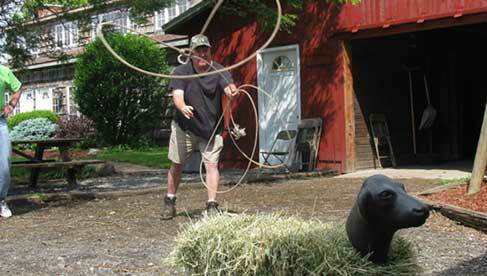 Also serviced by train and bus, the nearest city is Syracuse which is just a short 30 minute drive from the ranch. Whether you are looking for horse drawn sleigh rides, snowshoeing, snowmobiling, downhill or cross country skiing, or a combination of all these spectacular, cold season sports, this New York dude ranch provides the perfect setting for a nature-based winter adventure. 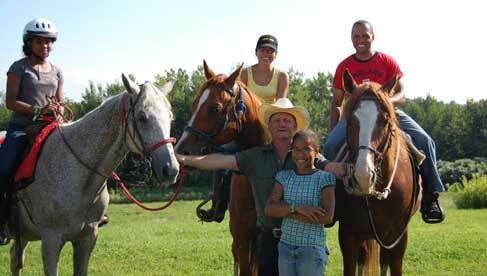 Wholesome family style meals are included at this New York dude ranch. 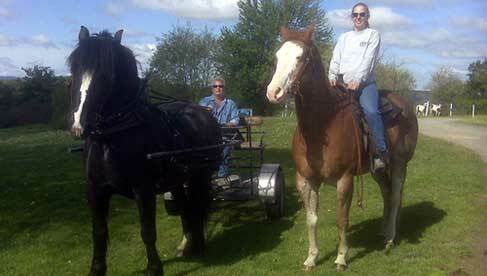 With advance notice wHill Top Ranch is happy to accommodate vegetarian and Kosher requests as well as special meals. A popular local scenic attraction is Chittenango Falls where guests can visit (by car). A picturesque 167 foot waterfall located in Chittenango Falls State Park. Glacial sculpting over 40 million year-old bedrock is responsible for this scenic feature. An interesting variety of both plants and wildlife may be found along the trails. Visitors can view the falls from the top, walk the winding trail into the gorge, view the falls from the footbridge and return to the top along the small trail on the opposite side of the gorge. Additional attractions include: The Adirondack Wilderness, 1000 Islands, Turning Stone Casino, Finger Lakes Wineries, Syracuse shopping and night life.